Hatchling: 8 - 10 in. 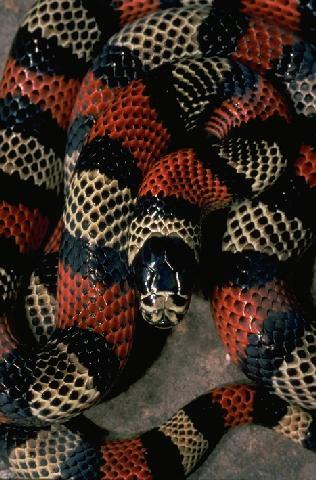 A tri-colored Milksnake with red rings sometimes tipped with black. This species tends to be dark. White snout with black scale margins. 24 - 37 red dorsal rings, white & red scales will normally have some24 - 37 red dorsal rings, white & red scales will normally have some black tipping. black tipping. All rings cross the body, white rings will sometimes some black blotches. Restricted to the Andes Mountain Range of Columbia. Mountainous areas of the Andes , species found in areas with elevations up to 9000'. In captivity these animals fair very well on a diet of lab. raised mice. Adults and juveniles are extremely voracious feeders. In the wild they mainly feed on rodents as adults. This is a species that does extremely well in captivity. It's large adult size makes it an oddity in any collection. The adults tend to be very tractable with the juveniles being somewhat flighty. Breeding in captivity is achieved in the same manner as with all colubrids using the following as a guideline. Towards the end of October cease feeding totally, allowing at least 2 -3 weeks at normal temperature for clearing of the gut. Then gradually reduce the ambient tempeture inside the cage to the lower 50's and maintain for a period of 3 months. Be sure and provide clean water and systematically check animals for general condition and welfare during this period. After brumation and the animals are brought back up to optimum temperature of 78 - 80 degrees, feeding should resume for approx. three weeks and the pair should be placed together under supervision for short periods of time until copulation can be confirmed. An egg laying chamber partially filled with damp vermiculite or sphagnum moss is helpful. Eggs should be removed immediately after laying and placed in damp vermiculite for the incubation period of 59 - 68 days at temperatures of 80 - 83 degrees. NOTE : This species is a montane species and fairs well in an environment that is slightly cooler than normal for Milksnakes.